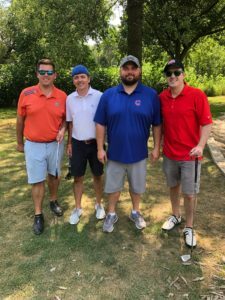 With 98 golfers and 6 volunteers, our Inaugural Henry Schueler 41 & 9 Golf Outing was a fantastic event for our Foundation! A very special thank you to Hank’s buddies, Jack Lynch & Chris Zaccagnini, for co-chairing the tournament. The course reached a sweltering 97 degrees, but that didn’t stop us! We had 21 sponsors supporting our mission to end pediatric leukemia. These amazing sponsors contributed $4,500. 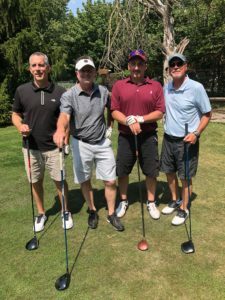 The winning foursome scored 11 under par and included: Michael Cermak, Michael LaMorte, Michael Lynch & Danny McDonough. Congrats gents! We raised more than $8,000 for the Foundation. A special thanks to our $500 level sponsors. We would like to extend a very special thank you to White Pines Golf Club for graciously hosting our tournament. 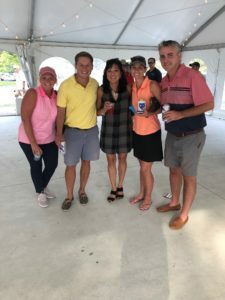 From the golf carts to the course to the food and drinks, the White Pines team took great care of our group. 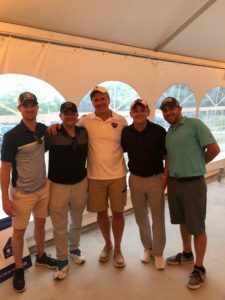 We can’t wait for our 2019 Golf Outing!